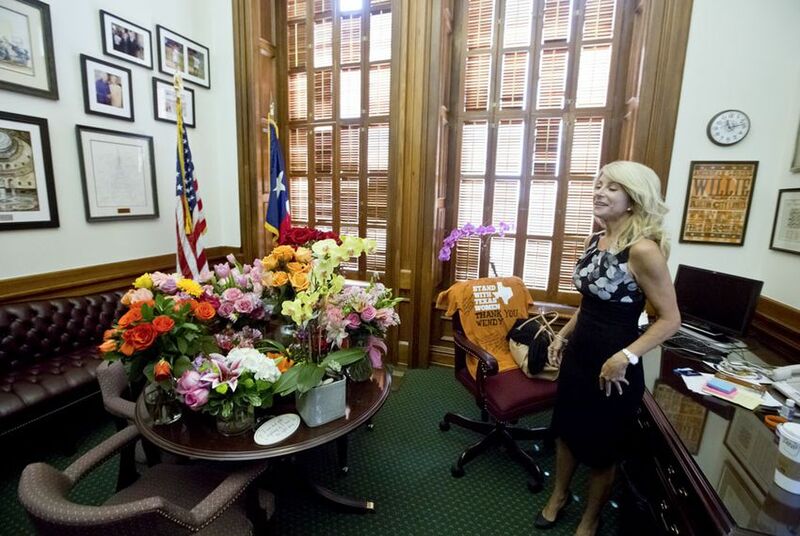 The new Democratic star in Texas politics has said she'll seek re-election to the state Senate, but the events of the last week put Wendy Davis in position for a bigger race — one that would be very difficult to win. Wendy Davis is never going to see a better moment for a statewide run for office, even though the odds of a Democrat winning statewide in Texas could not be worse. She would almost certainly lose. There are always more reasons not to run than to run. But she has emerged as the predominant voice on an issue that pits the party in power against the party out of power. She has a sea of orange shirts behind her, and the Republicans are clearly very, very irritated by her presence on the stage. They’re also irritated that their own officeholders are largely responsible for the attention she's getting. Vexing the Republicans, frankly, is a quality she shares with none of the Democrats who have run for governor of Texas since Ann Richards: She galvanizes her supporters and makes the other team crazy. Garry Mauro, Tony Sanchez Jr., Chris Bell and Bill White had varying combinations of money, experience, skill and leadership ability. Together, they had almost enough charisma for one candidate, which made them easier for Texans to disregard. Mauro got 31.2 percent of the vote; Sanchez got 40 percent; Bell, with two major independent candidates also in the race, got 29.8 percent; and White got 42.3 percent. Rick Perry has that same quality. His opposition can’t believe his success. They find him both irritating and hard to ignore. And the Republicans haven’t stopped voting for him since his first race under their banner in 1990. That might describe Davis. And it’s not clear she has what it takes to run a statewide race. She is a local candidate suddenly, and perhaps momentarily, stuck in the spotlight. She has no statewide network, and her political party doesn’t have the kind of infrastructure that parties are supposed to provide to candidates just coming into their own. Money is a problem, though her ability to raise funds in Texas and, more importantly, from elsewhere in the country, rose tenfold over the last week. She has a hot hand right now and could put some money together. The Republicans have the governor — if he decides to run again. And they have Attorney General Greg Abbott, who doesn’t have the Perry’s charisma but has that political infrastructure, lots of money ($18 million at the end of the year) and a party behind him that hasn’t lost a statewide election since 1994. A bettor would have to go with the Republicans. The Democrats, meanwhile, need to steal a page from the other party. The Texas GOP ran decent candidates for years through the late 1970s and into the 1980s, hoping that one might break through. Most lost. Most expected to. Bill Clements, a rich oilman, broke through the wall unexpectedly in 1978, and a scandal on the Texas Supreme Court started helping some Republican judges succeed on the ballot. Their other candidates — the George Strakes and the Rob Mosbachers and so on — never made it to statewide office. The odds changed as the state changed, largely in reaction to national politics. Part of the Republican success of the moment in Texas is tied to the unpopularity of Barack Obama. Every Republican on the ticket, or who wants to be on the ticket, has the president in the first or second paragraph of every press release and fundraising appeal. 2014 would be challenging even if the Democrats were somewhat competitive. Davis and her advisers have to weigh all of that. The party elders, if they are still talking to each other, have to figure out how to get candidates on the ballot who can actually get some public attention and keep the argument going — even if they lose their elections. It would be better for Davis to get this sort of acclaim from Democrats at a time when Democrats had a decent shot at office in Texas. It’s her bad luck that she’s the fastest runner on a team that can’t seem to find its way to the track. But if she doesn't run for governor now, it's not because it's a tough time for Democrats — it's because she doesn't want to be governor. She'll never get a better shot.